Most mornings driving to work, as I sit in the traffic, I think about Kilimanjaro. I imagine myself and Donna on her majestic slopes and I image what it is going to feel like to be there. I have gone over and over again in my mind what I can only imagine it is going to feel like when we make it to the top, Uhuru Peak, which sits at 5895m (19341 feet). Mountain climbers traditionally divide mountain altitudes into three zones: high altitude (2400 m to 4200 m), very high altitude (4200 m to 5400 m), and extreme altitude (above 5400 m). As I was sitting in the traffic this morning I looked across the bay at Table Mountain and I thought to myself – soon I am going to be climbing a mountain that is almost 6 x the height of Table Mountain. That thought alone really is just one of 101 ways to freak yourself out. I sat there, in the traffic, mentally placing Table Mountain on top of itself 6 x over! With just 36 days to go I thought I would give you a rundown of the route we are taking and a little bit of what we can expect on the slopes of Kilimanjaro. Our biggest challenge on this mountain is definitely going to be the altitude. Neither Donna nor I have ever climbed at altitude before and living at sea level doesn’t help either. Armed with my Diamox I look forward to it helping me breathe deeper at night and allowing more oxygen to reach my lungs as I sleep, in turn helping me acclimatise better. Our accommodation on our chosen route is tented. Yes, you see both Donna and I love to push ourselves to the limit and we generally like to rough it when we go on these sorts of trips. Luckily, we will have porters that are going to carry our tents, our food, our main bags and everything else that we need at our campsites. These porters too will be setting up camp for us before we arrive each day and breaking down camp each day when we leave to move higher towards the summit, they will also cook our food and look after us on the mountain. All we have to carry with us is our day packs, which will hold our water, rain jackets, warmer clothes and snacks for the day allowing us to concentrate on just putting one foot in front of the other. Pole, Pole is something we are going to hear a lot of the mountain I am told. It is Swahili and means Slowly, Slowly. In fact, we are not even on the mountain yet and it is being said often enough when we do our training hikes (not that we go slowly) but almost as if to start rooting it deep in our subconscious. On Kilimanjaro they make you go slowly, I’ve heard excruciatingly, painfully slow sometimes ~ but it will all be for our own benefit ~ You see going slowly helps you acclimatize better, increasing your chances of summiting. On the mountain we can expect temperatures anywhere between averages of 20°C to -25°C on the summit. We will at times climb below cloud, through cloud, above cloud, climbing in rain, snow, and tropical sun. The terrain we will climb through will range from rain forest, over heather, across a desert and finally on ice fields to the summit. 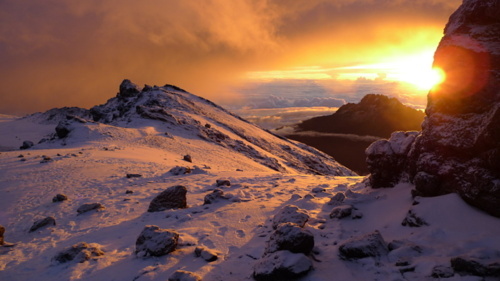 On Kilimanjaro, as a general rule of thumb you can expect the temperature to drop 1°C for every 200m (656ft) climbed. It is these vast drops in temperature that allows for the natural formation of five distinct vegetation zones on the mountain. Porters and guides will sort out the food and gear to be carried up while we register with the Park Board. Once all the formalities are seen to, we will start heading into the forest where lianas and mosses cover camphor, cedar, juniper and olive trees and so our ascent to our first camp will have begun. We should arrive at our campsite by late afternoon and by the time we reach our camp site for the night, our porters will have erected our tents. In the evening our cooks will prepare dinner, before we retire for our first night on the mountain. Apparently night temperatures can already be dropping to well below freezing point at this camp! Rising early we will begin our day with breakfast and a medical check! If the weather is good we will be able to take in our first view of the Western Breach of Kilimanjaro with its stunning glaciers. From Machame Hut we will head up a ridge into the moorland. They say the path is generally good, however, we will have to do occasional scrambling although another book I have says that they have since cut steps in the rock face. (Steps my favourite ~ even on Kilimanjaro it looks like I won’t be able to avoid them). Somewhere, we will stop for lunch and after our lunch break we will continue up to our next camp, Shira Hut. We should get views of Shira Needle, Shira Cathedral and East Shira Hill as well as the Western Breach. Shira Hut is an exposed camp and it can be expected to be a cold night and this is apparently where things can start to become a bit uncomfortable and as one of my books says “…. A bit uncomfortable and almost impossible with coughs and snores often breaking the peaceful evening silence.” I really must remember to add ear plugs to my list of things to buy! View of the summit from Shira Camp. Our route will now begin to turn into semi-desert and a more rocky environment and on this day we will reach an altitude of just over 4600m at Lava Tower. We will head east across Shira Plateau, heading directly towards Kibo. We will possibly stop for lunch before ascending a rock and scree path to Lava Tower. At this point we should have views of Little Penck Glacier and the Western Breach. 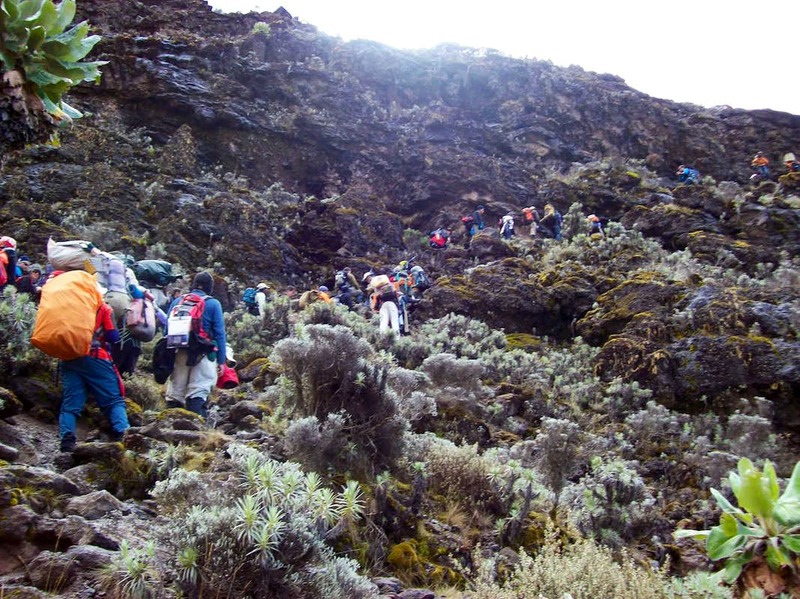 Once we have reached Lava Tower we will then again descend to Barranco Camp. On the way back down from Lava Tower we will apparently have fantastic opportunities to take some beautiful photographs of the Western Breach and Breach Wall. Our camp for the night will be situated in a valley below the Breach and Great Barranco Walls and apparently the sunset from this camp is something memorable. While our porters prepare our dinner, I look forward to sitting watch this sunset! After breakfast we will begin a scramble up the Great Barranco Wall ~ seemingly a very imposing sight at first ~ a wall that looks almost vertical! A few of the talks we have been to about climbing this mountain have said that climbing this wall is like the last bit of climbing on Lions Head. Reaching the top of this impressive wall will take us to 4200m. Our route will then head through the Karanga Valley, which will have us passing through a few other valleys which are due to offer us great views of Heim, Kersten and Decken Glaciers, which all form part of the Southern Ice fields. There is a river at bottom of Karanga Valley and this is the last water point before the summit. Our group will camp here for the night in Karanga Valley. 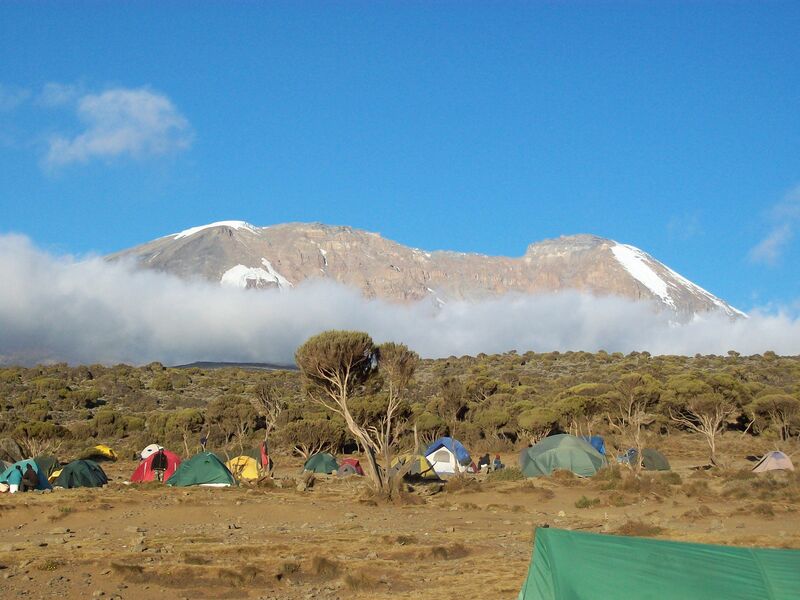 Some groups go straight onto Barafu Camp at 4600m but others camp at Karanga Valley to use the additional day to help with acclimatization. The Great Barranco Walk – A 800m vertical climb, which is apparently more daunting looking at it than actually climbing it! Day 5 will see us heading from Karanga Valley Camp (3930m) up to Barafu Base Camp (4600m), which is where we will prepare for our summit bid. Hiking time: Unknown ~ Pole Pole I guess! After a hearty breakfast, which I hope by now we are all still eating and that we haven’t by this point lost our appetites due to Altitude sickness, we will head up to Barafu Base Camp – our final stop before our summit bid. Just typing this gives me goosebumps! Barafu is the Swahili word for “ice” and the camp site we will head to on day 5 is described as “a bleak and inhospitable camping area to spend the night.” (Fantastic, something to look forward to!) This camping site is apparently totally exposed to the ever-present gales and the tents are pitched on a narrow, stony, and dangerous ridge. Honestly, what is climbing a mountain without a little bit of adventure, this is exactly why I signed up! But on a more serious note, this is a dangerous camp site and they warn you to familiarize yourself with the terrain before dark to avoid any tragedies. Their warnings are not to be taken lightly, and extreme caution should be used when at this camp as many fatal accidents have been recorded at this camp over the years. I trust my batteries in my headlight will still be working so when I need a night-time toilet stop (thanks to the Diamox I will be taking) I don’t go flying over some tent’s guy rope and go flying right over the ridge of Kilimanjaro ~ That really would be just plain tragic! Barafu Base Camp where we will spend a few hours trying to sleep before we push for the summit at 11pm. It will be a really early night at Barafu Base Camp with dinner I’m presuming in the late afternoon, early evening. Before dinner we will start getting our gear and clothes ready for our summit attempt and no doubt after dinner we will head to our tents to try to get some sleep for at 11pm that night we will head out and start our summit attempt. Night 5/Day 6 will see us rising when most of my friends and family back in South Africa are just going to bed. Thomas, our tour guide who travels with us up the mountain, tells us that we will be woken up with some hot chocolate given to us in our tent by his lead guide and at around 11pm we will leave for the summit. We will head out in a north-westerly direction up the South East Valley towards Stella Point. At Stella Point (5685m) we should stop briefly for a short rest and if I remember correctly Thomas said our lead guide hands us a cup of tea at this point as we are rewarded with what I can only imagine is going to be one of the most magnificent sunrises we have ever seen. (No need to say weather permitting, I trust with every fibre of my being that we will have a perfect morning to witness this moment)! Moving on from Stella Point it is possible that we will encounter snow and ice all the way up to Uhuru Peak. It is approximately a 2 hour ascent to the summit from this point. This is where the gained altitude results in rapid shortness of breath, severe headaches and nausea. Kinda makes you wonder why on earth anyone would want to do this? It is a long night that is apparently both mentally and physically challenging. Many, it has been said, literally sleep walk their way to the top. At the summit (5895m) the temperature can drop down to -25 degrees and the time spent on the top will totally depend on the weather. As it is so cold up there, you can’t stop for too long as it will be hard to get moving again due to the cold and fatigue. Thomas said it’s nice to go and find a place at the summit and just spend a moment acknowledging your achievement. I wonder if I cry will my tears turn to icicles? That could make for a rather funky picture! Once we reached the summit (fingers crossed) and had all our photo’s taken and done what you do at the top of the world tallest free-standing mountain, we will head back down to Barafu Camp, which can take over 3 hours. Here we will have a well-deserved rest or sleep, however, it will be a short rest and we will have to collect all our gear and our porters will pack up our campsite and we will continue to head back down to Mweka Camp, where we will spend our final night on the mountain. The camp is situated in the upper forest of the mountain. I am sure by this time we will be exhausted but I can almost picture Donna, with this look of awe and excitement of a child seeing something for the first time, screaming out to me, we just freaking climbed Kilimanjaro! You see this is something we do on our long hiking trips, we did it on Fish River Canyon and we did it on Otter Trail. It always gets us laughing and I know that no matter how tired we are going to be we will have the biggest smiles on our faces spreading from ear to ear, celebrating our successes! Day 7 will take us from Mweka Camp (3100m) to Mweka Gate. After what is no doubt going to be a delicious breakfast on our last morning on the mountain, we will make our way back down covering a short 3 hour and very scenic hike back to the Park gate. At this gate all successful climbers will receive a summit certificate. Those who climbed to Stella Point (5685m) are issued with a green certificate and those who reached Uhuru Peak (5895) will receive gold certificates. From the Mweka Gate we will then head back to the Mweka village, which I hear can be a muddy 3km hike (yes the hiking is not over yet!) Once we have reached the village, we will head back to our hotel in Moshi, the Springlands Hotel, where we will enjoy our first long overdue hot shower, our first in 7 days, we will eat and we will celebrate!! Donna, who doesn’t drink alcohol, has even said she thinks she will buy a beer called Kilimanjaro to celebrate, she adds she might not drink it but it will make for a good photo! 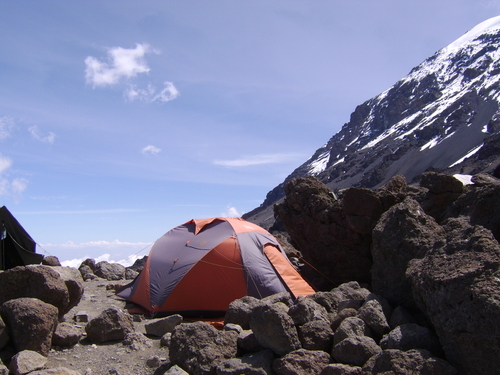 Lately I have been reading the stories of others who have summited Kilimanjaro and as they take me along on their journey with them as I read – through the scenery I will see, as they describe the tents they sleep in and the food they eat. I read as they watch what undoubtedly must be the most beautiful sunrise of their lives ~ I can hardly wait until it’s me watching this absolute wonder on top of the world largest free-standing mountain. I know I will be left standing in speechless-awe. Then finally, I read as they describe the pain and anguish of summit night ~ many describe this as the longest night of their life and many turn back at this point ~ I feel every single bit as though I am there with them as they experience it all ~ Talk about visualisation! The best bit is when they step onto the top and see that summit sign for the first time, I am literally overwhelmed reading of their joy and elation and I imagine what it is going to be like when Donna and I reach the top. I remember clearly two years ago as we drove on a very bumpy gravel road to the starting point of The Fish River Canyon. I remember Donna asking everyone to say one word of what we were feeling at that very moment. I think I said overwhelmed. Seeing that first sight of the canyon unfold before me overwhelmed me and brought tears to my eyes ~ it was such a sense of “I’m really living my ‘Living To Do List’ ~ there truly is nothing that beats that feeling. I imagine that is exactly what it is going to be like on summit night when we finally see the top of Kilimanjaro and we take those final steps to summit and we can say we have made it. Mostly I am just filled with pure and absolute excitement but if I think about it a little too much, I can feel the fear coming up but I guess having a little bit of fear is good and I am sure that anyone who have climbed Kilimanjaro has felt the same fears that occasionally spring to mind. I am certainly not invincible and this is all becoming very real. I can hardly wait to witness this most beautiful sunset and to sit beneath the night sky watching the stars. I believe that both Donna and I are both mentally and physically fit to make it to the top ~ We have been training hard and we both have the right mental attitude to get us to the top. To stand there celebrating our victory ~ I sit here as I type and I feel that overwhelming feeling creeping up ~ each and every sensation I can imagine of what it will be like. The only difference is that it will be x 100 more awesome!!!! The journey for Donna and I will not end there, the next day after “stepping” off the mountain, some of us with hangovers of note I am sure, will head out on our own as the rest of our team flies back to South Africa. Donna and I, with just our backpacks on our backs and loads of adventurous enthusiasm, will head out to explore Tanzania and Kenya and if we have time an island or two as well…. 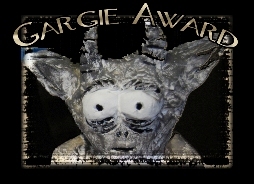 One last thing before I go, last but certainly not least, a very big thank you to my latest donor Claire McTaggart. Thank you for helping someone breathe a little bit easier and for helping us take another step closer to finding a cure! If you are new to this page, tied in with my climb up Kilimanjaro I am raising funds in memory of my best friend, Emma Walker, who passed away at the age of 22. She bravely fought Cystic Fibrosis while here on earth and I am raising awareness about CF and raising funds for those who live with Cystic Fibrosis and I raise funds in hope that one day we can find a cure. If you would like to make a donation towards my chosen charity, The South African Cystic Fibrosis Trust, please visit my fundraising page by clicking HERE ~ All donations of any size are greatly appreciated and you can donate from any country in the world via a secure website. All funds go directly to The South Africa Cystic Fibrosis Trust (SACFt). If you would like to read more about SACFt please click HERE. Everything about this climb is in memory of my best friend, Emma. I miss her every day ~ still. Picture sources listed below photo or picture is linked directly to the website. Previous Happy ChooseDay! Next We are not climbing UP that are we? Which airline are you using? You’d better let me know when your leave CPT as I have just gotta be there to see you and Dons off friendy!!! Love you loads and am taking all those big deep breaths for you!!! 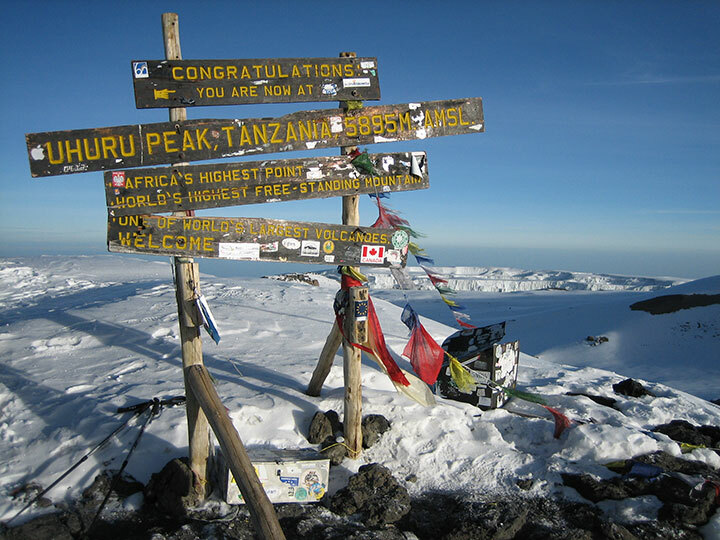 I’m climbing Kili in July from the 9th to 16th. We’re heading up the Rongai and heading down Machame. Good luck with the training for your climb! Oh how fantastic, well maybe we will see you somewhere near the top of the mountain ~ just listen out for someone calling “Is there a 5th Grade Teacher here?” at the campsites :) I had a quick read of your latest post and I’m glad to see I am not the only one who struggles to get up at ridiculous hours on a weekend to go hiking! All the best for your training too, looking forward to following your journey!